Misconception Two – Greyhounds Always Chase Anything That Moves. As a greyhound owner I have had the odd experience of owners with small breeds of dog crossing the road to avoid us. I have to say in Suzie’s case this makes me snigger (which I politely internalise) but I also feel quite sad. It means the wrong word is spreading yet again about greyhounds – they are not necessarily the chasing and killing machines that some people perceive them to be. Sadly we do have to be realistic too though. The truth is that there are incidents where greyhounds chase other pets (or wildlife) and they may cause harm. I cannot overstate the devastation that this brings to pet owners and so I am certainly not laughing at this. (I have also owned smaller breed dogs and cats and I know how they are equally a part of the family as Suzie is to me now). However, the situation is not common because in most cases pet greyhounds simply do not act like this if they have been properly re trained and socialised from the track once retired. What does make me laugh is that in Suzie’s case, at her stage of life and ‘post-track de-training’ as I call it, dressed in her cartoon bunny rabbit collar, large rolling eyes, wiggly anteater like nose, gently sniffing and never being boisterous or impertinent – she can still strike fear into the heart of passers by! I even once had some teenage girls flatten themselves against the Town Hall wall, saying “It’s a wolf!” Suzie looked at me – I looked at Suzie and on we walked. However, there’s no good denying that greyhounds that are reared for racing are trained from the first to chase anything that moves at a certain height and speed, are consistently rewarded for this. They have a strong natural instinct to do this too and humans have exploited this, breeding it in further. Each day of training builds on this until (who can blame them) it is what they understand as their role. This does not mean that their role cannot change successfully later in life however. The important part is the retiring of the hound and how you deconstruct the ‘Working Racer’ view of their life and role, and re build it as ‘Pet Dog’. The most important thing to remember is that it can be done in 90% of cases and with the benefit of some expert advice it can be an amazingly rewarding process. 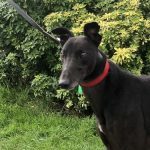 While in ‘re training’ the greyhound will be wearing a basket muzzle which prevents any accidents while they re-learn the rules and although some people may see this as unfair, in fact the dog will associate the muzzle with going for a walk and so be excited when it is asked to wear one. They even push their noses in as soon as they are offered! The muzzle also gives a clear indication to other people as to the stage of the greyhound’s development. The second most important thing to remember is that you can never trust any breed or individual dog 100%. For example I would never leave even Suzie unattended with a child, although I would bet my life on her being fine – I still wouldn’t do it. The same applies to other interactions in their daily lives. Greyhounds also have to contend with their predisposition to sight, chase and catch anything moving. So any prospective owners must be ready to be committed to re training this instinct and to being vigilant throughout the process. 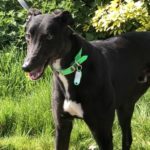 With patience, time and the proper know how, you can end up with a dog who shows every sign of relief that they don’t have to chase for a living and who will enjoy socialising. The delight you see on their faces when they understand they can truly play with any dog is literally tear jerking. 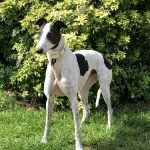 I know several greyhounds who live happily with cats and several more who live with Jack Russell’s and other smaller breeds. The re training in these cases has worked you see. 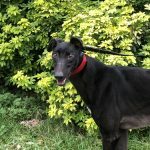 Greyhounds are gentle, compassionate creatures who just need some understanding that their chase instinct needs modifying and controlling for their new life. Remember: what humans have been telling them solidly for 3 years – has suddenly become untrue. Many ex racers catch on quick to this alteration and then you have the most dedicated, loving and low maintenance pet you can imagine. Occasionally, as with every breed of dog there are more difficult cases and those individuals will need caution and responsible handling long term. Suzie is at the extreme and positive end of this spectrum of re training, experience and attitude alteration. She is often to be seen being walked by my students, some using mobility aids, some having never handled a dog before; gently tip toeing along never pulling, or even stopping for a sniff if she knows they need care (she does just know, yes). When I first got Suzie – knowing their nature from previous hounds and research – I braced when rabbits appeared. With Suzie her ears went up, but that was all. Later I braced when a cat ran away from her fearing the worst = she glanced. Sometime later still I distinctly remember a squirrel appearing by her feet and legging it away from us (!) and I braced hard then, as my life (and probably the squirrel’s) flashed before my eyes = one step forward ears up. Then plodding and sniffing again. 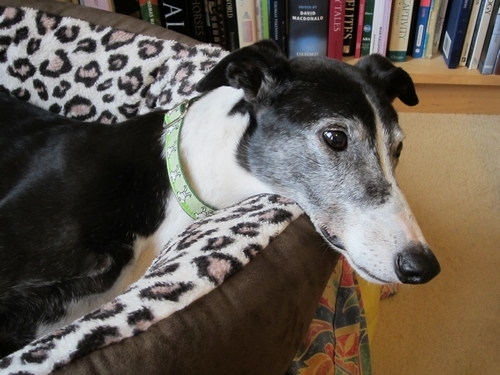 She is now a qualified therapy dog for ‘Pets As Therapy’ too – using her gentle calm nature. The local neighbourhood cuddle cat used to regularly invite herself through my flat window in hotter weather and stroll across the carpet in front of Suzie. She would then claim my boyfriend’s knee smugly, and go to sleep. Suzie lifted her head the first time this happened, looked a bit surprised, looked at me… and then went back to sleep! Now if that isn’t proof of ‘post-track de-training’ being possible I don’t know what is! 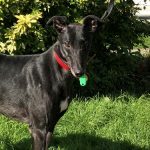 So, some advice: when choosing your greyhound rely on your re homing centre’s experience of judging the dog that is right for you. Decide between you and then be clear about your role in the transformation from racer to snoozer. 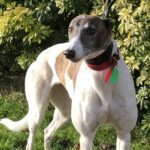 You will have to work on this, perhaps go to classes to help you and your greyhound learn right from wrong together and possibly also accept that just a few of the greyhounds homed in a year will have to remain in a muzzle for walks (remembering they look forward to this aspect of their life) long term. As time goes on you will get to know you own dog and their individual reactions but I would always advise caution in parks for example; where you are likely to see small breeds. It can literally go wrong in a fraction of second and you need to be as prepared as possible for this. Don’t take chances and control as many factors as you can. 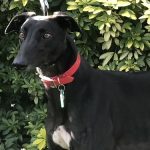 You will need a sensible strong lead (not an extendable one), a good greyhound collar (wide around the delicate areas of their long necks), a muzzle for all greyhounds when they are being re trained, and also consider what times of the day, and where, you are walking. You will need to introduce these new rules gradually and with understanding – as well as a dose of firmness. Knowing all of these things and with experienced help and support throughout the gradual process you will be rewarded tenfold! 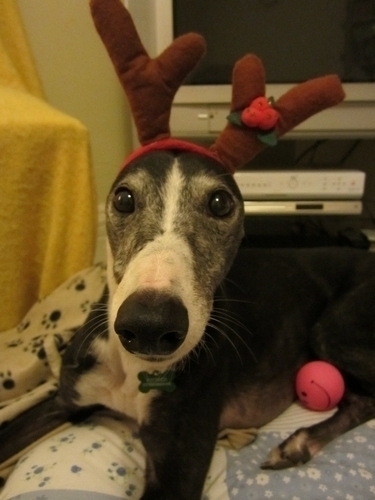 This entry was posted in Greyhound Lifeline Blog and tagged greyhound Blog by Marie. Thanks Penny, smashing photos of your ‘wolf’ and a great post. When I got my rescue dog I was advised to ask exactly what ‘cat tests’ (!) had been performed (as I already had a cat at home) . The place I got my hound from took us upstairs to where the ‘stunt cats’ lived so I could see exactly how she behaved with the cats. So it’s always worth asking how the dog has been ‘cat tested’ and how it behaved during the tests. We would love to hear from you, please leave a comment or if you have any questions please enter them into the comments section.